The patient is a 6.5-year-old male with no past medical history who presented with a chief complaint of decreased PO intake and crampy abdominal pain for the past 3 or 4 weeks. Initially, he was thought to have gastroenteritis and supportive care was given. During a follow-up visit with his pediatrician, the patient was noted to be pale. Initial laboratory evaluation showed a hemoglobin of 7.4, hematocrit of 23, and an MCV of 77.7. Iron studies revealed he was iron deficient, with an iron level <10 and an increased iron binding capacity. He was started on oral ferrous sulfate. Three to four days prior to admission, his abdominal pain significantly worsened. He also complained of nausea, vomiting, and several episodes of diarrhea. 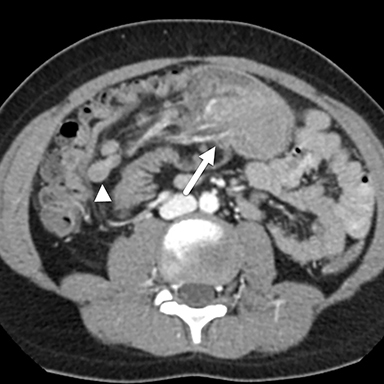 Given the child’s symptoms, a CT of the abdomen was performed. 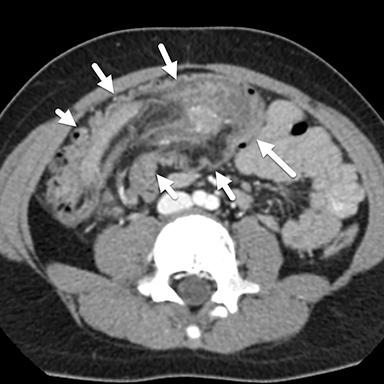 It showed a colonic intussusception of the transverse colon (Figure 1) with a large mass acting as a lead point. In addition, there were scattered moderate-sized mesenteric lymph nodes. Based on the imaging findings, the patient underwent a right-sided hemicolectomy to resect the mass and intussusception. Microscopic analysis of the mass revealed a “starry sky” appearance. Immunohistochemical staining showed neoplastic cells consistent with Burkitt lymphoma. FISH analysis was indicative of a MYC oncogene rearrangement, commonly associated with Burkitt lymphoma. Intussusception caused by Burkitt lymphoma is extremely rare. However, Burkitt lymphoma is the most common cause of intussusception in children over 4 years.2 While patients who present with intussusception as their first clinical sign are diagnosed earlier, this does not change the prognosis as patients with the sporadic form of Burkitt lymphoma have an excellent prognosis regardless of the staging of the disease. Burkitt lymphoma commonly involves extranodal sites, usually when bulky disease is present. 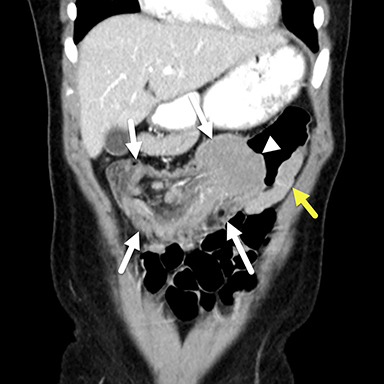 The usual site of involvement in the sporadic forms is the GI tract, with a mass present in 1/3 to 2/3 of all cases.2 The typical areas of involvement include the terminal ileum, the cecum, and the appendix, due to the high amount of lymphoid tissue present in these areas.3 Usually, the tumor spreads circumferentially within the submucosal and/or deep mucosal layers.3 This presents as bowel wall thickening or a mural mass. The mural masses can sometimes serve as a lead point for intussusception. On ultrasound, affected bowel is hypoechoic with wall thickening and loss of the stratified appearance.1,3 Sometimes a hypoechoic mass may be visualized. If intussusception is present, the target sign with alternating hypoechoic and hyperechoic lines can be seen.3 This represents bowel wall within bowel wall and central echogenic mesenteric fat. On CT, a mass with central necrosis is often present.3 If the tumor affects bowel, the wall is markedly thickened with minimal enhancement. The wall thickening is usually asymmetric. Depending on the area of tumor invasion, the bowel lumen may be narrowed or have aneurysmal dilation. Narrowing of the bowel wall is due to mass effect, while dilation of the bowel wall is due to invasion into the autonomic plexus or muscularis propria. Invasion of these structures halts peristalsis and causes an aneurysmal appearance. If intussusception is present, the intussuceptum is seen telescoping into the intussucepiens. Fat and mesenteric lymph nodes are pulled into the intussusception. At MR imaging, the mass has a homogeneous low signal on T1-weighted images and increased signal on T2-weighted images.2 The mass and affected lymph nodes show restricted diffusion. Burkitt lymphoma is the most common pediatric gastrointestinal malignancy. It typically affects children and is the most common cause of intussusception in children older than 8 years of age. 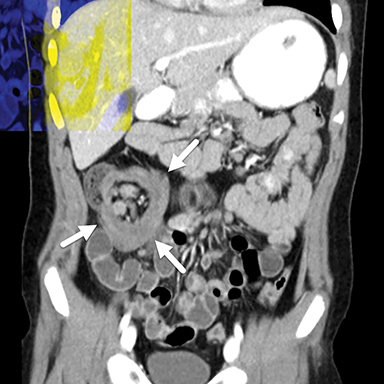 On imaging, Burkitt lymphoma classically appears as a mass with diffuse, asymmetric bowel wall thickening and aneurysmal dilation of the gut lumen. Brodzisz A, Woźniak MM, Dudkiewicz E, Grabowski D, Stefaniak J, Wieczorek AP, Kowalczyk J. Ultrasound presentation of abdominal non-Hodgkin lymphomas in pediatric patients. J Ultrason. 2013;13(55):373-378. Chung EM, Biko DM, Arzamendi AM, Meldrum JT, Stocker JT. Solid tumors of the peritoneum, omentum, and mesentery in children: radiologic-pathologic correlation: from the radiologic pathology archives. Radiographics. 2015 Mar-Apr;35(2):521-546. Chung EM, Pavio M. Pediatric extranodal lymphoma. Radiol Clin North Am. 2016 Jul;54(4):727-746. Fallon SC, Redell MS, El-Bietar J, Lopez ME, Vasudevan SA, Brandt ML. Intestinal perforation after treatment of Burkitt’s lymphoma: case report and review of the literature. J Pediatr Surg. 2013 Feb;48(2):436-440. Devita R, Towbin RB, Towbin AJ. Burkitt lymphoma causing colocolonic intussusception. Appl Radiol. 2019;48(1):48A-48C. Prepared by Dr. Devita while at Case Western Reserve University, University Hospital Medical Center, Cleveland, OH; Dr. Richard Towbin while at Phoenix Children’s Hospital, Phoenix, AZ; and Dr. Alex Towbin while at Children’s Hospital Medical Center, Cincinnati, OH.